The Curse of Blondie is the eighth studio album from the American rock band Blondie. It was released in October 2003, and peaked at #36 in the UK. The band departed from bankrupt Beyond Records and signed with Sony Music. 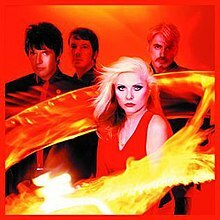 The Curse of Blondie had the working title Phasm 8, which was also the name of the tour they were doing before the release. Craig Leon, who had also produced their previous hit album No Exit, started work on the album, but it was four years in the making as the only demo tapes of the album had disappeared from luggage at a UK airport, and so had to be re-recorded. Leon ultimately did not produce the album, which was largely helmed by Steve Thompson with Jeff Bova producing only one track, "Good Boys". The album incorporates a rock-inspired arrangement style more reminiscent of Blondie's earliest recordings. Rhythms played include mostly rock ("Golden Rod, "Rules for Living", "End to End", "Hello Joe", "Last One in the World", "Diamond Bridge") and then dance-pop ("Good Boys", "Undone", "The Tingler"). Other incursions are Japanese traditional music ("Magic (Asadoya Yunta)"), reggae ("Background Melody (The Only One)"), jazz ("Desire Brings Me Back", "Songs of Love (For Richard)") and rap ("Shakedown"). The track "Hello Joe" is an homage to Joey Ramone, and includes a reference to "Blitzkrieg Bop" ("hey ho, hola Joe instead of hey ho, let's go). The only single from the album was "Good Boys", which peaked at #12 in the UK and was a dance hit in the USA. Promo singles of "Undone" were sent to radio, but no official release was made. ^ "THE CURSE OF BLONDIE [album]". deborah-harry.com. Archived from the original on 2014-02-01. Retrieved 2014-02-01. ^ "Blondie – UK Chart Positions". officialcharts.com. Retrieved 30 January 2014. ^ "UNDONE [single]". deborah-harry.com. Archived from the original on 2014-02-01. Retrieved 2014-02-01. ^ a b "The Curse Of Blondie by Blondie". metacritic.com. Retrieved 8 March 2017. ^ "The Curse of Blondie". ew.com. 9 April 2004. Retrieved 8 March 2017. ^ Sullivan, Caroline (2 October 2003). "Blondie, The Curse of Blondie". Retrieved 8 March 2017 – via The Guardian. ^ "Blondie: The Curse of Blondie". popmatters.com. Retrieved 8 March 2017. ^ "Robert Christgau: CG: Blondie". robertchristgau.com. Retrieved 8 March 2017. 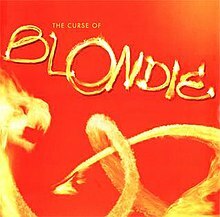 ^ "Blondie - The Curse Of Blondie". Uncut. Archived from the original on 2008-09-05. Retrieved 2012-09-22. ^ "The Curse Of Blondie". rollingstone.com. Retrieved 8 March 2017. ^ "Shakedown: Blondie's "The Curse of Blondie" Turns 10". wordpress.com. August 8, 2013. Retrieved 2014-02-01. ^ Caulfield, Keith (9 August 2005). "Ask Billboard". Billboard. Retrieved 21 April 2018.